I've been looking at everyone's Top Nine in 2016 on Instagram and reading resolution posts on Facebook and it really got me thinking about what's important to me. Thankfully, I'm surrounded by wonderful and inspiring friends. 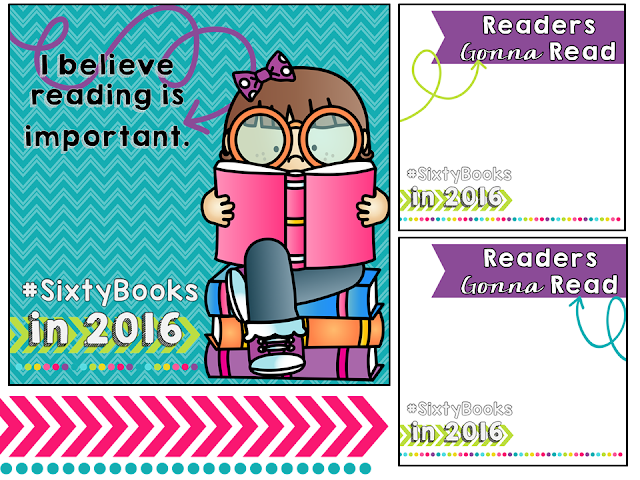 A post on Twitter made by my great friend @LiteracyforBigKids was encouraging her followers to sign up for the #SixtyBooks in 2016 Challenge. Instantly, I thought - Oh, no, I can't do that. That's MORE than a book a day! But then, I thought this is important to me. Making time for reading is important and shows my students that reading is important. What can it hurt? What if I read 40 books instead of 60? It's not about the number, it's about the reading. So, I jumped in and pledged to read 60 Books in 2016. I'm feeling optimistic and I'm going to go in with a long reading wish-list. Are you ready to take the pledge? Ready to join this reading movement? Click the images below to grab your own templates. Don't forget to hashtag #SixtyBooks and #ReadersGonnaRead on Twitter & Instagram! Link up below to share your Reading List for 2016. Elisabeth - Yay!! I'm so excited to see what everyone's reading in 2016! I'm in! Looking forward to all the great books to be read this coming year! I can't wait to start! I love reading, but when I read sixty books I felt a bit anxious. So I was relieved when you said "It's not about the number, it's about the reading." Thanks for making helping me feel like I can do this. Can't wait! Thanks for posting about this! YAY!!!! So glad I found this challenge! Let the reading begin. Don't forget that reading will make your life very easy because reading and http://www.bestessays.com/ will give you precious knowledge always. So everyone should try to make reading the part of their lives to learn something new always.